Boogie Bigelow does not want to attend kindergarten. After much consoling from her parents, the little girl finally believes she can go to school. But the day before her big day, Boogie becomes sick with butterflies, nausea, and a tummy ache. Her parents take her to school, only ... read full description below. By Dolmo, M. Ed Psy D. Norma a. Boogie Bigelow does not want to attend kindergarten. After much consoling from her parents, the little girl finally believes she can go to school. But the day before her big day, Boogie becomes sick with butterflies, nausea, and a tummy ache. Her parents take her to school, only to have Boogie throw a tantrum on the playground. 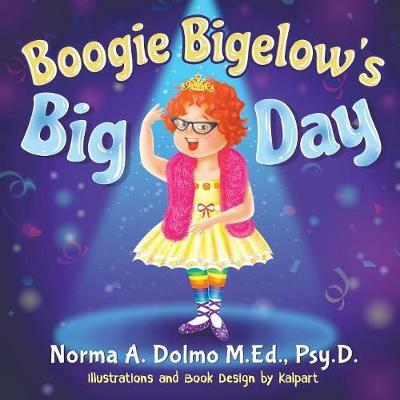 The teacher greets Boogie and her parents, and she comforts and encourages Boogie to enjoy her big day. Boogie soon forgets about her fears and begins to enjoy her first day at school. 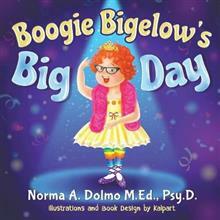 Boogie Bigelow's Big Day will help young children with separation anxiety to overcome their fears. Norma A. Dolmo, M.Ed., Psy.D., is a doctor of clinical psychology. She is also a practitioner of Biofeedback training, a Master-level Reiki practitioner, and is certified in Contemporary Cupping Modalities. She attended Phillips Graduate University, where she earned her doctorate, with an emphasis in diversity. Dr. Dolmo has been working as a mental health clinician for over 20 years. Starting her career as an early childhood educator teaching preschool, she later developed skills in health care as a child life specialist, working in major Los Angeles County hospitals, where she provided services for chronically ill pediatric patients and their families. She currently helps families in general, as well as young children with separation anxiety. The author has been published in research journals and has written several children's books. She lives in Los Angeles, California.